If you’ve ever wondered what makes the aurora take on the amazing forms it does you’ve got company. Marilia Samara and the crew of aurora researchers at Alaska’s Poker Flat Range head up the NASA-funded Ground-to-Rocket Electrodynamics-Electrons Correlative Experiment, or GREECE. Their mission is to understand what causes the swirls seen in very active auroras. Here’s what we know. Electrons and protons from the sun come charging into Earth’s magnetic domain called the magnetosphere and strike and energize molecules of oxygen and nitrogen in the atmosphere between 60 and 200 miles overhead. The molecules release that extra energy as the greens, reds and purples of the northern lights. And those picket-fence, parallel rays that can suddenly spring from a quiet arc are created by billions of electrons spiraling down individual magnetic field lines, crashing into atoms and molecules as they go. Because the lines of magnetic force are closely bunched, as shown in the illustration above, we see side-by-side, tightly spaced rays. What we less about is how the twists, swirls and eddies form. Scientists suspect the swirls may take shape as a result of Kelvin-Helmholtz instabilities or Alfven waves. The first occurs when two fluids or gases moving at different rates of speed flow by one another. In a familiar example, wind blowing over water creates ripples that are amplified into curling, white-topped waves. Alfven waves are created when flows of electrified particles from the sun (plasma) interact with Earth’s magnetic field. To study the structures, sounding or research rockets are launched directly into an active display of northern lights to gather electrical and magnetic measurements. At the same time, cameras on the ground record the dance of rays and arcs above. Samilla and her team at GREECE then compare the aurora’s shifting shapes with real-time data gathered during the rocket’s 600 seconds of flight. And that’s exactly what the team did this past Monday morning March 3. Conditions looked good from Poker Flat the previous evening with a flurry of red and green arcs after sunset. At about 2:10 a.m. Alaska time, after careful monitoring of activity, the order was given to launch. 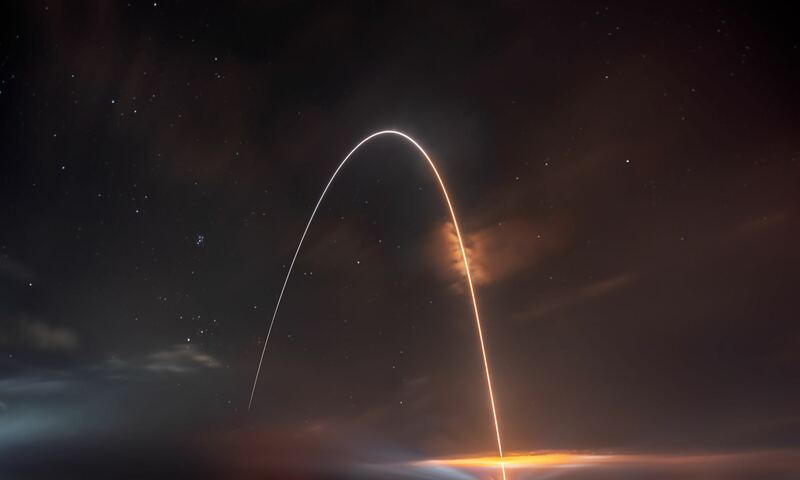 The rocket soared to an altitude of 220 miles (354 km) and recorded data as the video and still cameras whirred on the ground during the 10 minute 15 second long flight. There must be a bunch of happy scientists at the Range this week. They have their work cut out for them; those few minutes of data collecting will mean years of work to track down the cause of the beautiful curlicues that make our hearts leap at the sight. Poker Flat Research Range, the world’s only scientific rocket launching facility owned by a university, is located about 30 miles north of Fairbanks, Alaska and is operated by the University of Alaska’s Geophysical Institute under contract with NASA. Most of the research there involves the aurora with sounding rocket launches done about once a year. While waiting for the right moment to launch, members of the team exercise their poetic side by writing and sharing haikus about their beloved aurora. Here’s a sampling, and there are more HERE.